First things first! This past saturday, I started the 18-week training program for the Chicago Marathon on October 22nd, 2006. I was antsy as I had not run since the Boston Marathon in Mid-April. Had been active in other sports: spinning, kickboxing, hiking, stairmasters, ellipticals and even pilates; but had stayed away from running to give my knees a rest. As I laced my shoes and hit the road for the 7-mile run, my trepidation melted away, and the miles flew by. I knew why I run: Coz I love it! I ran much slower than my marathon pace, but heck, my first run in more than two months and it felt good! We are off to Toronto for the long weekend. My first invitation to give a (non-science) talk, “Konkani Temples in Goa: Strengthening the Faith” at the North American Konkani Samellan. The organizers had seen a couple of my blog entries on the Ramnathi Devasthan and the Mangeshi Devasthan and asked me to share my thoughts. While I have presented more than a 100 scientific presentations at international meetings, this one is making me nervous! Coz, its not science! Science is putty, temples are stone! 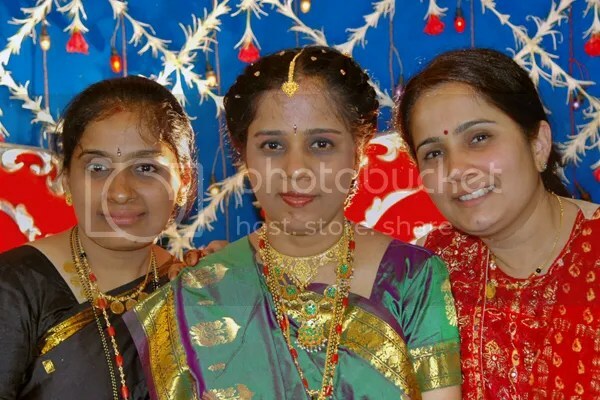 Our India visit was to attend M&apos;s youngest sister&apos;s wedding. Here&apos;s a pic of the three sisters at the evening reception. M is on the right. Monsoons In Mumbai – Be Safe!